Now, the reason no evidence—mounting, or otherwise—of runaway climate change was cited there is because there is no evidence of runaway climate change. Let alone man-made. 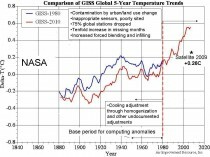 There is as there always has been a continuing stream of evidence of changes in climate, because change is the sole constant in climate. But it takes an environmentalist or axe-grinding politician to say that whatever happens is evidence supporting his faith and/or agenda. The ‘runaway’ business is just absurdly hyperbolic. Which, again, is why no such evidence was actually cited. Get this straight because once they agree on a talking point they beat it to death: their new one, of 2010 being the hottest year ‘on record’, would not rise to the level of evidence of man-made warming despite being touted as a self-evident example of cause-effect. 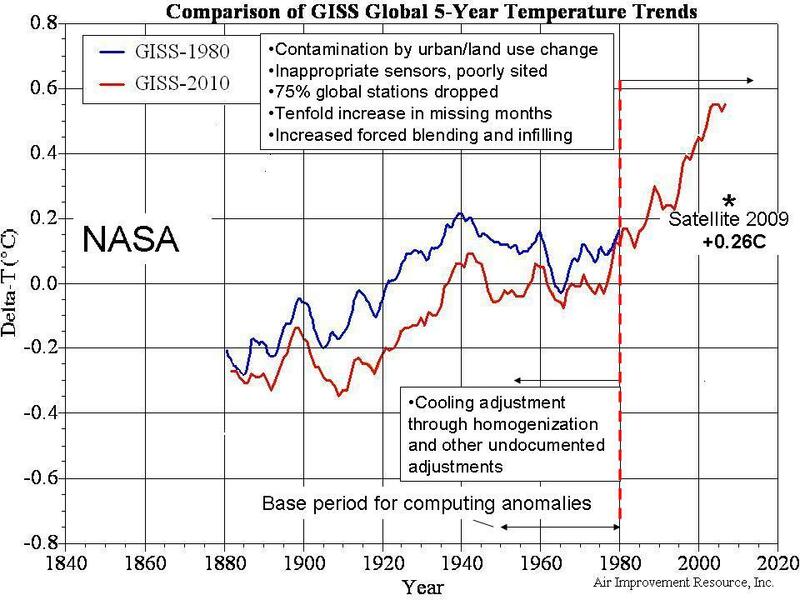 This would remain true even if the cited source, NASA—meaning James Hansen’s runaway office, known as GISS—had not also done two things: adjust the historical record to make older years cooler (rewriting history) and ‘extrapolate’ data over vast stretches in the Arctic where they have none...but which happens to be where they find the warming (making history up). None of which is secret, all of which then makes the above-cited paragraph an embarrassment. Then the reporter discussed what the global warming industry plans to do about this, and includes the following predictable punch telegraphed. ...Sen. Joe Lieberman (I-Conn.), co-author of several unsuccessful climate bills over the last decade, said he agrees with the need to make more local connections for the public. Hitting home for him are studies showing lobster and winter flounder moving north out of Long Island Sound. Yes, the world changes and, of course, if something happens then you did it and their agenda would change it. Even if after billions of dollars and several decades they cannot make their case and are reduced to doing what they started with. Primitively pointing to the world around them and shrieking that the witch—now, the SUV—did it. Man-made global warming is causing Mt. Kilimanjaro’s glacier to recede. Mt. Kilimanjaro’s glacier is receding. The CIA brought the World Trade Center down. The World Trade Center came down. Your ‘conclusion’ is actually an assumption. And that’s too stupid even for Washington to re-engineer the economy around. Here’s to an invigorating 2011.